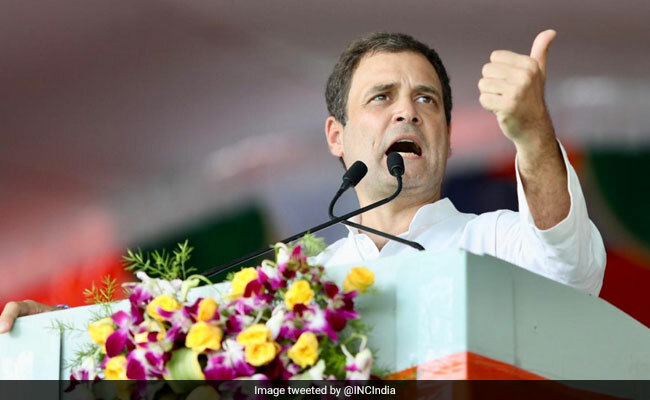 An aggregate of opinion polls ahead of the next round of assembly elections in November-December shows that the Congress may win two of the crucial BJP-ruled states -- Rajasthan and, with a wafer thin margin, Chhattisgarh. The BJP is expected to retain only Madhya Pradesh, a state it has been ruling for three straight terms. Much rides on the results of the elections in the three heartland states, seen as bellwether before next year's general elections, in which the BJP-led NDA will seek a second term in power. A Congress victory in two states will be a huge boost for the opposition, which has been trying to unite to stop the victory march of the BJP. 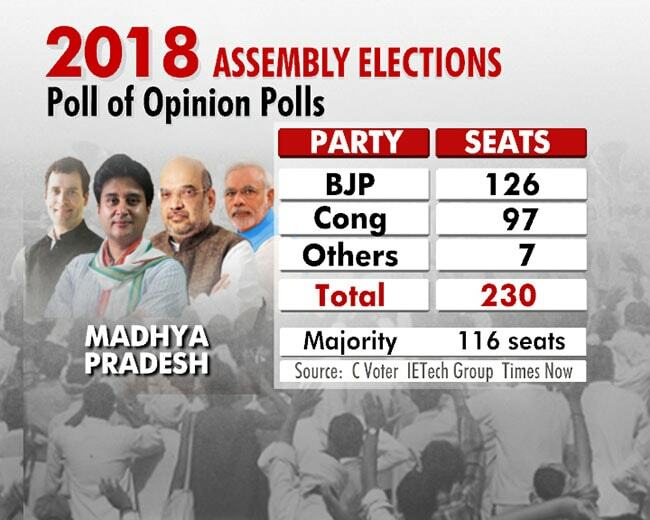 Of the 230 seats in Madhya Pradesh, the BJP will win 126 -- a majority but way below its 2013 tally of 165 seats. The Congress will get 97 seats, up from 58 seats last time, shows the poll of opinion polls, taking into account opinion polls conducted by C Voter, IETech Group and Times Now. The majority mark in the state assembly is at 116 seats. 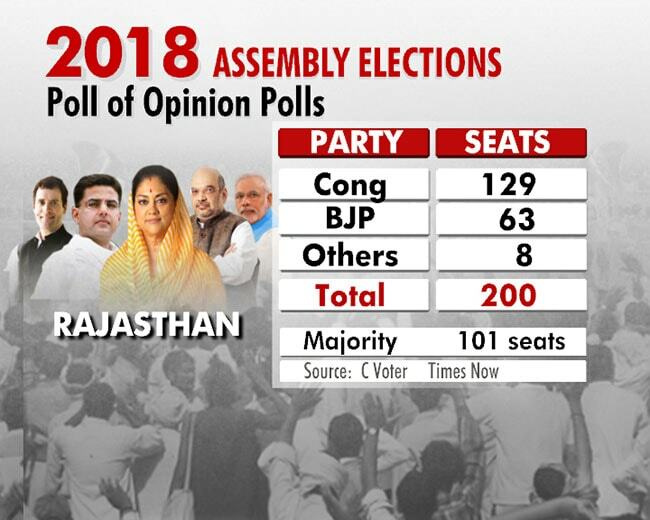 Rajasthan, the aggregate of two opinion polls shows, will stick to its trend of voting out the incumbent party. The Congress, which had been decimated in the 2013 elections, winning only 21 of the state's 200 seats, will return to power with 129 seats, shows the aggregate of C Voter and Times Now opinion polls. The BJP, which won 163 seats in the 2013 elections, is expected to get 63 seats. The majority mark in the assembly is at 101 seats. 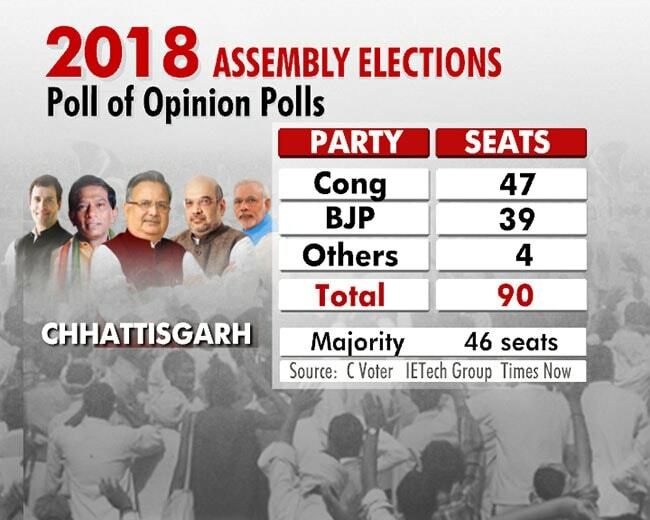 The aggregate shows Congress crossing the halfway mark, barely, in Chhattisgarh. In Chhattisgarh, another state where the BJP is seeking a fourth term in power, the aggregate shows Congress crossing the halfway mark, barely. The party will win 47 seats in the 90-member assembly -- way ahead of the 39 seats it won in the 2013 assembly elections, but only with a margin of 1 past the halfway mark, which lies at 46 seats. The BJP will get 39 seats, down from last time's score of 49 seats, shows the aggregate of the C Voter, IETech Group and Times Now opinion polls. In Telangana, Chief Minister K Chandrashekar Rao's move to go for early elections is expected to pay rich dividends. His Telangana Rashtra Samithi, a local party, will emerge as the big winner, leaving both Congress and the BJP far behind. The TRS is expected to win 85 of the state's 117 seats -- the majority mark is at 60. 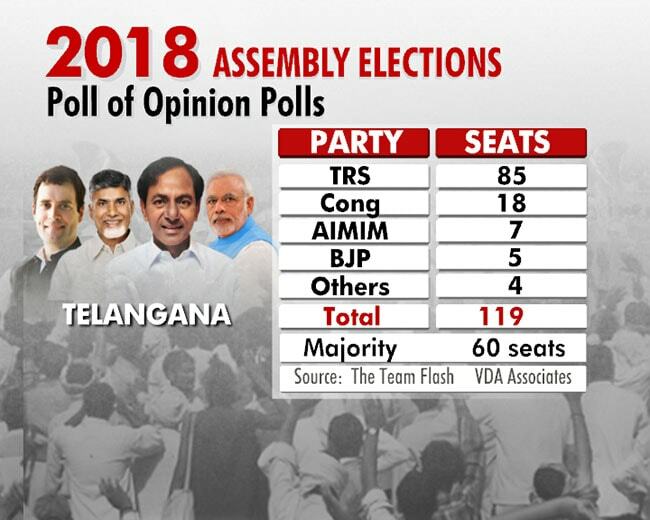 The Congress is expected to get 18 seats, the BJP 5 and the local AIMIM 7 seats, shows the aggregate of the opinion polls conducted by The Team Flash and VDA Associates.